A stockpile of spent Hamas rocket shells at a storage depot in Sderot, Israel. The Gettysburg Address is one of the most recognizable speeches in American history. It is also one of the briefest – amounting to a powerful but spare 269 words. For the average person, reading the first thirty words of this speech takes about fifteen seconds. Now, imagine your life depended on finding a secure bomb shelter in the time it would take to recite Lincoln’s familiar opening line. For over a decade, running for their lives has been a reality for the people of Israel. 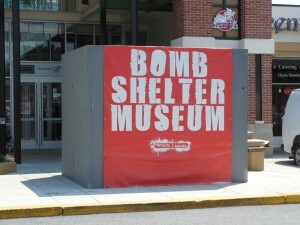 Bearing witness to this truth is the Bomb Shelter Museum – an exhibit currently on display at the Greenspring Shopping Center in Pikesville, Maryland. The stark Bomb Shelter Museum at the entrance to the Greenspring Shopping Center. Since its completion earlier this year, the mobile museum has traveled the country with stops in New York, Miami and Washington, DC. An incredibly stark model of an actual bomb shelter – four dark walls and a gripping three-minute video presentation – the museum was created by the group Artists 4 Israel to demonstrate the effects of Hamas terror attacks against the civilians of Sderot. Sderot – a city of 21,000 – is located less than a mile from the Gaza Strip. On winter nights, the temperature in these simple shelters can reach as low as 10 degrees. In the summer, it can reach over 100. The shelters have no windows for air or light, nor do they have toilet facilities. Huddled en masse, Israelis are left to wait for the all clear signal to sound, only to return again with each new wave of Hamas rocket attacks. According to the Israel Defense Forces, since 2001, more than 15,200 rockets and mortars – an average of over 3 rocket attacks a day – have targeted Israel. Counted within that number are more than 11,000 rocket attacks since Israel withdrew from the Gaza Strip in 2005. These numbers are eerily similar to the final tally of the deadly German Fieseler Fi 103 V-1’s and Vergeltungswaffen V-2 rockets of WWII. And like the infamous Nazi buzzbombs, Hamas rockets mete out a devastating psychological toll. According to one study, more than 75% of the residents of Sderot suffer from Post Traumatic Stress Disorder. The IDF also notes that most rockets launched from Gaza into Israel are capable of reaching Israel’s most populous cities, including Jerusalem and Tel Aviv, leaving more than 5 million Israelis under the threat of attack. Robert Slatkin, the BZD’s treasurer said the shelter will be manned by members of the organization to answer questions about the display. Slatkin also said the display is free and open to the general public. One person who will be manning the shelter on Monday is an area resident named Leigh. Leigh said she has just returned from visiting family in Israel. Many Israelis are alerted to imminent attacks by a special app on their phones. Did Leigh encounter any attacks while she was in Israel? Leigh almost reluctantly added that, when she came home from Israel last week, she was awakened one night by a clap of thunder; certain for one terrifying moment that her home was under attack. If you go to the Greenspring Shopping Center today and park in front of Miller’s Delicatessen or the Shopper’s Food Market, think about how long it takes to make the leisurely stroll from your car to the Bomb Shelter Museum. Then ask yourself: Could I reach that shelter in 15 seconds if my life depended on it? 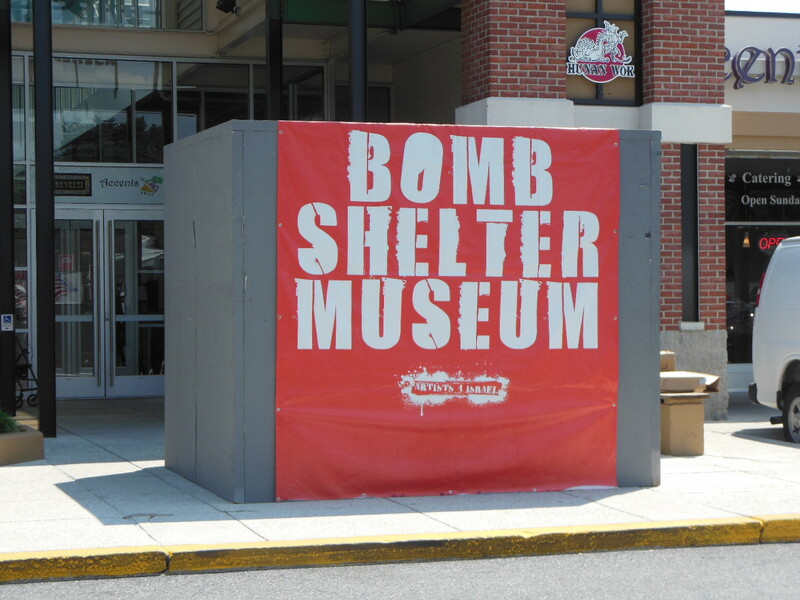 The Bomb Shelter Museum will be on display Sunday Aug. 3 from noon – 8pm and Monday Aug. 4 from noon – 4pm at the Greenspring Shopping Center, 2801 Smith Ave., Pikesville, Maryland 21209. The exhibit is free and open to the public. Please be aware that the short video presentation may be too intense for small children. A great concept. Perhaps a visit to this museum will sway the thinking of the people who do not think Israel’s defense of itself is justifiable.